As the name suggests, here’s answers to some questions we get asked all the time. Still can’t find what you’re after? Let us know. If you’re after facts, figures and a touch of history, you’re better off over on the About Wagga page. You can drive, fly, catch a train or a bus to Wagga Wagga… If you’re super keen (and we hope you are!) you could also walk or ride a bike. See our Getting Here page for more details. Out and about exploring? Find a map of, or search for, public toilet locations in Wagga Wagga and surrounding areas on the National Public Toilet Map. Looking for pet-friendly accommodation? Head over to our Stay page and use the ‘Refine your search’ functionality to find suitable properties. If you’re having trouble, give the friendly, knowledgable staff at the Wagga Wagga Visitor Information Centre a call on 1300 100 122. 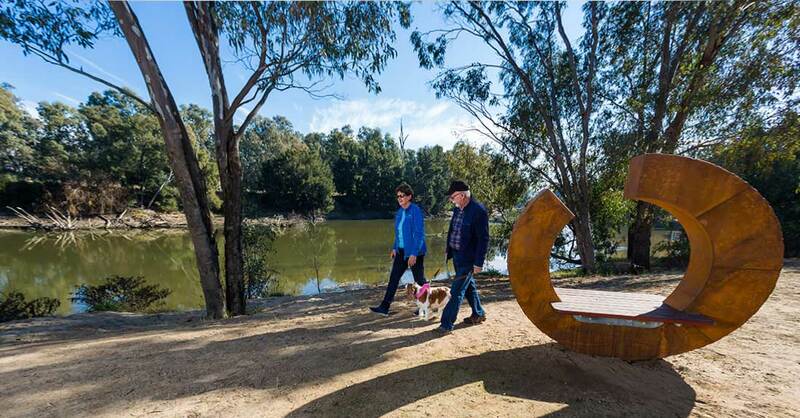 The City of Wagga Wagga website includes a list of off-leash areas for dogs. The Wagga Wagga landscape plays host to four distinct and magnificent seasons whose sunlight and shade give your Instagram filters a run for their money. Visit us in high summer, and you’ll be looking for a refreshing dip in the Murrumbidgee River or to escape the heat with some retail therapy. In autumn you’ll think it’s paradise – clear, cool mornings and crisp days will follow you through piles of coloured, crunchy leaves and turn every vista into a photograph. and spiderwebs into tiny, tiny works of art. Spring is a celebration of life, food and love – punctuated by outdoor events and spectacular yellow, purple and green landscapes. Find the latest forecast on the Bureau of Meteorology website. Thinking of moving to Wagga? Head to the Welcome to Wagga page on the City of Wagga Wagga's website. You might also like to visit Wagga Wagga's section on the Evocities website. A campaign aimed at attracting Sydneysiders to move to a regional city, the website includes information on employment, property, education and lifestyle.